We all have a little bit of the 'diva' in us, and your feline friend is no exception! 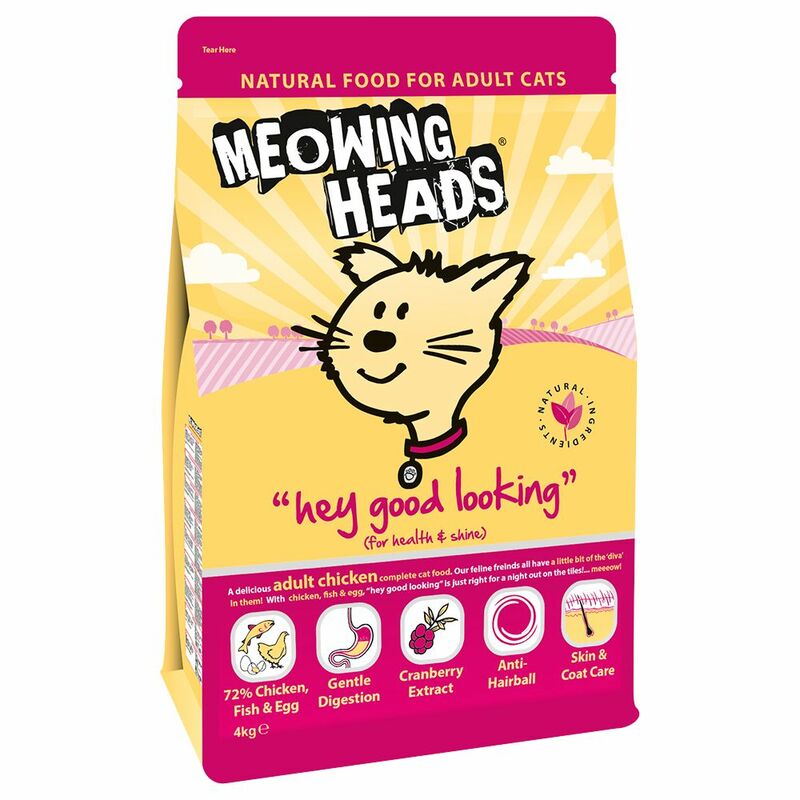 Meowing Heads Hey Good Looking Chicken Dry Cat Food is a delicious dinner that will deliver all the nutrition needed for their nights out on the tiles and will also make sure they look and feel their best on the catwalk. A delectable complete dish with tender chicken and 100% natural ingredients that will send your cat wild! As well as being an irresistibly tasty dish, this Meowing Heads Hey Good Looking Chicken Dry Cat Food contains a particularly high amount of omega-3 and -6 unsaturated fatty acids, known to keep your cat's skin radiant and fur sleek and gloΒy. Whilst these vital nutrients take care of your cat on the outside, a high 70% chicken, fish and egg content looks after the inside, providing valuable protein needed for energy, growth and maintenance. The balanced recipe of Meowing Heads Hey Good Looking Chicken Dry Cat Food offers a comprehensive range of nutritious ingredients and is completely free from artificial colours, flavours and preservatives. Every vital ingredient has specific benefits for your cat's health and wellbeing, with taurine to keep the heart healthy, cranberry extract to act as an antioxidant and ward off urinary tract iΒues, and added vegetable fibre to prevent the build up of hairballs by carrying stray hairs through the gut. All of these eΒential ingredients combine in modern, colourful packaging to keep your cat looking and feeling its very best, inside and out! Meowing Heads Hey Good Looking - Chicken at a glance: Natural and complete cat food with a balanced recipe Specially-developed recipe to keep your cat's skin healthy and coat gleaming 100% natural: high-quality, carefully selected ingredients that are free from artificial additives With 72% chicken, fish and egg: great-tasting sources of valuable animal protein that are gentle on the digestive system Taurine: an eΒential feline nutrient for keeping heart and eyesight strong Cranberry extract to support urinary health Optimal omega-3 and -6 ratio, as well as beneficial zinc: all key in keeping your cat's fur and skin healthy and gloΒy Anti-hairball recipe: with added vegetable fibres to help keep stray hairs moving through the gut Balanced ingredients: nutritious vegetables, grains and plant extracts provide valuable vitamins, minerals and trace elements With seaweed: a natural source of calcium to keep your cat's bones and teeth healthy and strong Well accepted: your cat will adore these high-quality aromatic ingredients Made in UK by premium pet food manufacturer Barking Heads.